Low back pain is a very common condition in the population and most likely we will all experience some back pain in our their lives. What are lower back discs ? The inter vertebral discs separate the vertebrae of the spine. Discs in theory have a role in absorption and stabilisation as well as allowing movement in the back joints. Specific types of pressure and repeated strain can cause a disc to become irritated. 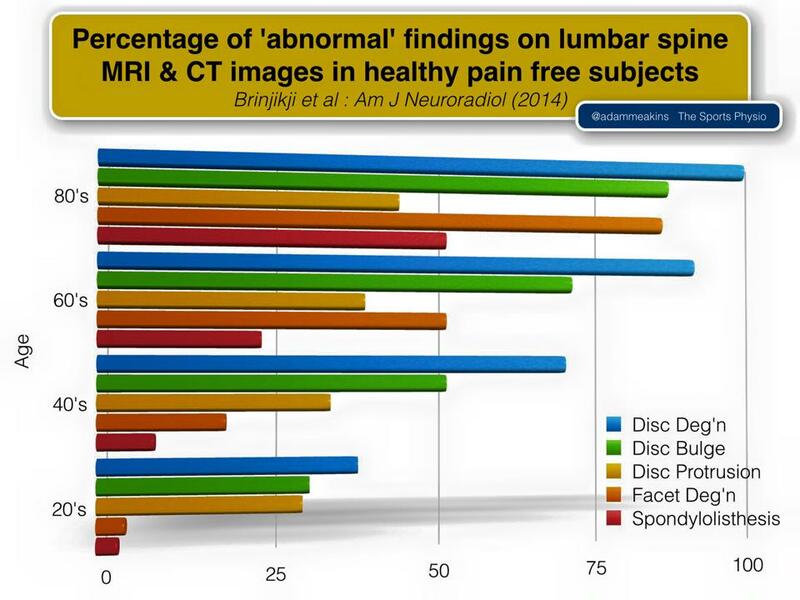 Normal pain free people can have all disc changes on their spinal scans including MRI and CT's. Here is a great graph that shows the percentage of normal people with so called disc budges, herniations, joint degeneration etc etc. Yes pain free, normal people with abnormal findings on scans. 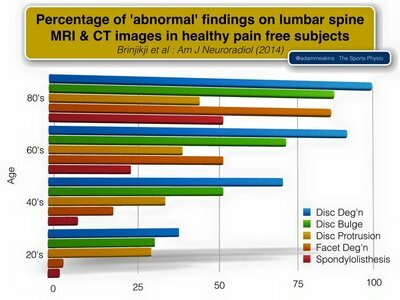 Pain is not simply related to the level of disc changes on a scan but also has to do with all psychosocial factors. Pain worse with bending or sitting for extended periods. Incorrect lifting techniques- This theory has been debunked. As a matter of fact, our spines naturally moves with a little bend and in fact with conditioning can become very strong. Watch this video of the heaviest weight any man has lifted. Click here . " Back not straight"
Poor posture has been widely publicised as a caused of disc injury but there isn't real research to back up this theory. However, Curitn University are currently researching this at the moment and hopefully the results will clarify this for us. However, there aren't any real direct link that these interventions have a direct affect on the disc budge in the current research but some do have an effect on reducing pain perception. Unless you have a severe nerve compression causing leg numbness, muscle strength loss, loss of reflexes than surgery should not be performed. There has been over 200% increase in spinal fusions an all in the private sector. Back surgery for back and leg pain only is no more effective than good, high value physiotherapy care. massage - Muscle tension is usually a symptom of the underlying problem and can assist to unwind a tense area. spinal manipulation and joint mobilisations have no clear conclusive evidence that it has any sustained benefit. Dry needling or acupuncture has no clear research to back up its effects for disc budge related pain. Ultrasound, interferential, shockwave, any most machines haven't been shown to speed up recovery. Our clinic uses a cognitive functional approach to back care management of spinal related pain. We will work with you to develop a management program addressing all aspects that are limiting your recovery. Click here to listen to a report on this type of approach.